"...I've always considered this piece a brilliant blend of populism and cultural criticism and a fine gateway for the young not just into performance, but into visual art, that being a love of the co-founders. Such still is the case. The show has true historical significance in the trajectory of live commercial performance, If you've never had the pleasure, it awaits. But it is, of course, hard for what now has become a settled, long-running brand to remain on the vanguard." "...Watching the show for the first time in many, many years, I was struck by how prescient that mind-set happened to be. For here is a performance piece full of ideas — about art and the art market, visual perception, the science of optics, the nature of group dynamics and much, much more. Yet out of a fear of appearing too brainy, it knowingly dumbs down — disguising itself as a mindless fraternity-like group ritual full of subtly understood “rules” drawn primarily from rock concert culture. In other words, much like our culture as a whole, “Blue Man Group” is fully ambivalent." "...Three silent guys in cobalt blue makeup, accompanied by a small but very loud rock band, perform a wordless, high-tech, highly visual work of participatory conceptual theater. Blue Man Group offers a visceral education in the tenuous division between art and trash." "...Performance art, street act, vaudeville show, drum session, sketch comedy, tech fair, carnival party, science experiment, rock concert, alien sighting ... Briar Street Theatre's Blue Man Group is all these things and more, wrapped tightly into a one-and-a-half hour, roller-coaster-paced production unlike anything you'll see anywhere else. Revolving around the explorations of three blue-skinned, bald, humanoid, gender-neutral figures-silent yet with a penchant for making percussive sounds and communicating through their eyes-Blue Man Group makes for a truly unique variety entertainment." "...It's witty. It's fun. It's ever-evolving. Heck, it's even rocking. The almost lethal combination that is "Blue Man Group" has been packing the rows at the Briar Street Theater for nearly 10 years." "...What BLUE MAN GROUP has always done, and continues to do, best is create visually dazzling manifestations of house music with a driving beat that is nothing short of irresistible. They are delightful percussionists and their supportive band is fantastic." "...It’s nothing if not interactive: An audience member sitting in the “splash seats” is probed, not anally (as aliens usually prefer), but with an oral scope that pretends to inspect his innards. Another audience member becomes the subject of the Human Paint Brush, his entire body wrapped up, spray-painted and rubbed into art, as a closed-circuit camera shows us all the backstage shenanigans. (This audience member was a work of art in his own right.) A third volunteer is taken on stage and treated to a very bizarre meal of Twinkies that spewed out of her faster than they were ingested." "...Blue Man Group is for everyone: kids, couples, visiting in-laws, clients, fun people, boring people, people with taste, people without taste. It's an immersive, multi-media, comedy-rock-dance-party-show spectacle for all! If you haven't seen it, you should; if you haven't seen it recently, bring the kids, the new girlfriend, the family you have nothing to talk about with; if you have seen it recently, you might just as well wait a couple years, it'll be around." "...If you want a night out that will guarantee you and your companions enjoy yourselves, Blue Man Group will satisfy in more ways than one. It's musical, funny, visually stunning, and accessible to broad audience. It has a more mainstream patina than its source which bugs me, but it's a safe bet for those intimidated by edgier theater shows. Where else can you end a night bouncing gigantic beach balls whilst covered in toilet paper dancing to a song about butts?" "...What makes this show what it is? There is no language barrier, as the majority of the show is without speech. Only some brief announcements and electronic signage, which are in English are used to transmit information to the audience. Most of what we enjoy for 90 straight minutes is three men, bald and blue in brown jump suits, exploring the things they find after finding themselves in a new world!" "...The bottom line is that "Blue Man Group" falls into the category of "If you like this sort of thing this is the sort of thing you will like." And the passing years indicates that lots of people like the idea and the presentation." "...Blue Man blue me away! What a trip!! Plan a visit for the first time or a return engagement. For me, the best part of the show was taking my nephew again. He loved it as a kindergartner and again as an adult. And I loved hearing his infectious boyish laughter both times." "...Blue Man Group is a treat. It’s an event, and it’s enthralling. This show is a lot of spectacle, but with a lot of thought put into it as well. Perhaps most importantly, it’s the kind of show that makes people who don’t normally see theater get out and buy a ticket! Everyone wants to see Blue Man Group, the same way that everyone wants to see a big summer blockbuster. And the fact that this show manages to create something like this, and actually respect the intellect of their audience, might be one of the most notable theatrical feats of the 90’s, 2000’s and beyond." 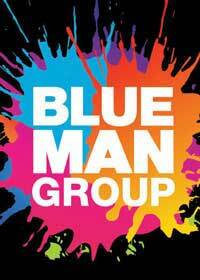 "...An evening with Blue Man Group is pretty much guaranteed to leave you smiling. It’s inventive entertainment of a kind you just can’t find anywhere else. I saw the show in its first year here in Chicago and have long held fond memories of those three expressionless blue men. The updated version, the first time in over two decades I’d seen the production, doesn’t disappoint. Part music and light, part performance art, part comedy, part social commentary, and partly just plain goofy, the Blue Man Group continues to be part of the fabric of Chicago. You’d have to be Scrooge not to have fun at this show." "...It is amazing how they create music with pipes and make drums out of barrels, all backed up by a live rock band that accompanies them throughout. The show is colorful, paint is splashed as music is being made in a spectacle of sound and image that awakens your senses. The members of The Blue Man Group are masters of mimic and words are not needed for them to connect with the audience from the stage. But the show is an immersive experience and they come down and mingle, connect with different people, in different areas of the theatre, so expect to have one of them staring at you with big eyes right in front of you."